A Great First Quarter For Ultra Cleaning Service! It seems to have gone by in a bit of a blur, however everyone here at Ultra Cleaning Service has thoroughly enjoyed Q1. We’ve had several highlights including new contract wins, additions to our team, extra qualifications for our workforce and enhanced equipment. We even had a new website built, amongst other things! Here, we’d like to share some details about a few of our favourite things from the last month or so. Firstly, we’re really pleased with our new van! If you follow us on Twitter you might have noticed we introduced her at the beginning of March. She drives like a dream and is fully kitted out and liveried up. 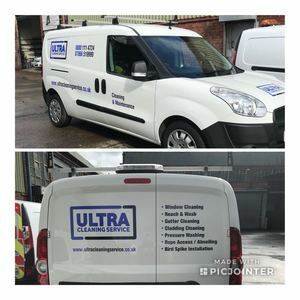 With ‘Ultra Cleaning Service’ branding proudly emblazoned, our new van is sure to turn heads wherever she goes. Keep your eyes peeled and give her a pip if you see us! Building on our continued growth and recent success, our MD, Julian Chadwick, is delighted to be welcoming another new starter at the beginning of April. Enhancing our team is of utmost importance and we’re also proud to announce that our colleague, Andrew Henderson, has passed his ‘Level 1’ rope access/abseiling course too. We’re pleased with the effort he’s put in and want to wish him congratulations on this great achievement. 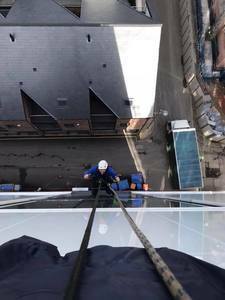 Speaking of rope access/abseiling window cleaning, we’ve also added a dedicated section to our website for this popular service. If you’d like to learn more you can check it out here. It’s been a busy few months and we’re delighted to be winning more work than ever. We won two new reach and wash window cleaning contracts in Manchester city centre, for example, which have been keeping the team very busy. Another highlight included winning a gutter cleaning contract for a prestigious property management company. 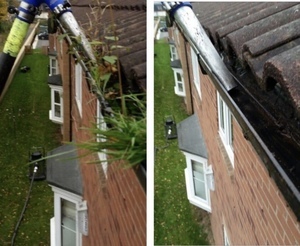 This contract was for 32 sites across the North West and the team enjoyed putting our Gutter-Vac to good use. Three Quarters Of The Year Still To Go! We’ve had a great start to the year and we’re convinced things are only going to get better and better as 2018 continues. A special thank you to our staff for their continued commitment and all of our customers for trusting us to provide their commercial window cleaning and high-level maintenance solutions. We’re certain we’ll be getting even busier as the year goes on and if you’d like to learn about any of our services in more detail, please click here. Carl Richardson on Where Did January Go?!?! ?